É sem dúvida uma das notícias do dia, a inauguração do edifício mais alto do mundo, com 818m e 162 andares, que vem destronar o Taipei 101 (Taiwan). Artigo "Burj Dubai is the height of architecture – just don't look down" The world's tallest building may be a triumph of beauty and ambition, but the soulless cityscape surrounding it is another matter (por Steve Rose). Para ler o artigo na íntegra clicar aqui.
" (...) In 1956, Frank Lloyd Wright unveiled a scheme for an elegantly preposterous mile-high skyscraper for Chicago, safe in the knowledge that he'd never have to figure out how to build it. It was undoubtedly an influence on the Burj Dubai. It even had a similar triangular structure. But Wright's intentions with his mile-high skyscraper were to create a concentrated human habitat, the better to halt Chicago's unstoppable urban sprawl, and free up ground space for parks, nature and leisure. The Burj Dubai, by contrast, has become the tentpole for several more acres of anonymous, soulless, energy-hungry cityscape. You can apparently see for 60 miles from the top, but when you look down, the immediate landscape is the same schematic real-estate tat you see everywhere else in Dubai: vast shopping malls, bland office towers, sprawling residential developments semi-themed to resemble "traditional" Arabian villages, outsized ornamental fountains. 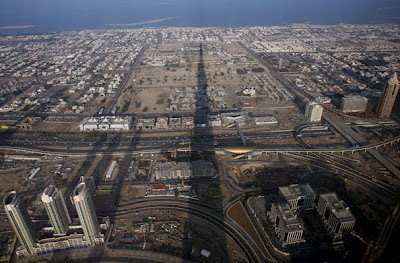 The Burj Dubai might be a triumph vertically, but what about the horizontal?" Galeria de Fotos do edifício ("Gallery: From Foundations to Finished Product") Clicar aqui. Curto vídeo com uma vista aérea aqui. O A Crack in the Cloud é apenas mais um blog de música, informal e despretensioso, criado com o objectivo de comunicar e partilhar ideias e impressões de concertos e outros eventos musicais, especialmente fora do circuito mainstream / comercial. A Crack in the Cloud, título pouco adequado a um blog, é parte de um verso do tema "English Civil War" dos The Clash. Descreve o momento em que um raio de sol fura um céu densamente nublado, iluminando um dia sombrio. Foi escolhido pelo facto de ser uma metáfora interessante de esperança, perserverança e também da comunicação e partilha de ideias. "Authority is supposedly grounded in wisdom, but I could see from a very early age that authority was only a system of control and it didn't have any inherent wisdom. I quickly realised that you either became a power or you were crushed". Entrevista aos GRITO - OI NORTENHO!!!! News And Suchlike... First Post Of A Few Tonight! Punks United: Impressões de The Casualties, etc. Punks United: Impressões de The Casualties etc. Green Day: Os grandes perdedores de 2009?